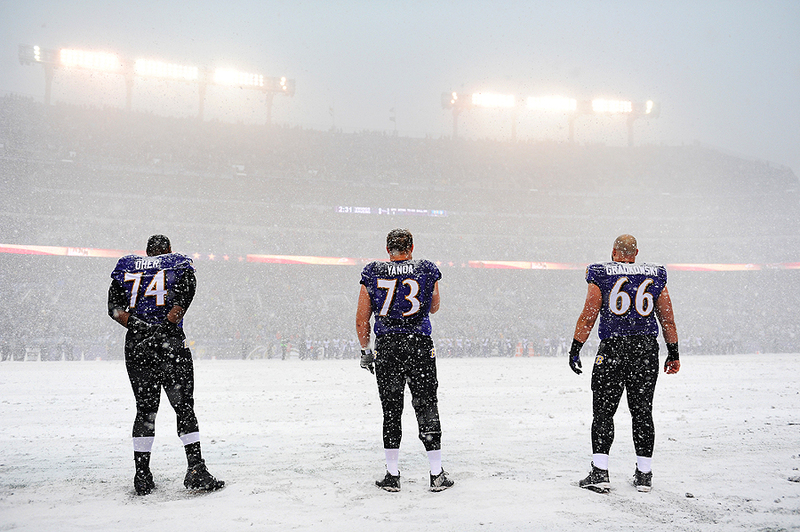 "Tackle Michael Oher #74, guard Marshal Yanda #73 and center Gino Gradkowski #66 of the Baltimore Ravens stand on the snow covered field during the national anthem before playing the Minnesota Vikings at M&T Bank Stadium on December 8, 2013 in Baltimore, Maryland." As a photographer, snow makes everything better. Forecasters called for inclement weather on the east coast going into football Sunday, but when I left the house before the Minnesota Vikings versus the Baltimore Ravens game, I was thinking it was all a fluke. By the time I arrived at the stadium there was still zero precipitation. It was looking like another dry game. However, by the time kick-off rolled around, it was nothing short of a white out, and the field was completely covered with snow. But being football, the game must go on. After rushing around the field trying to get some unique player introduction images with longer glass, I quickly turned to my shorter glass in an attempt to find some pregame features. Seemingly alone, I found myself shooting the far end of the Ravens sideline as the snow dumped during the national anthem. It was one of the few pregame images I really enjoyed as I continually ran around trying to find something different before kick-off. More from the game to come.